In case you have managed to solve all the problems you have faced when you decided to travel abroad and finally travelled to another country talking in another language, and Ops, you don’t know their language, Then, this article is for you. Having a multilanguage speaker in your pocket might be one of the most important things you need to have along with some money and your passport, as you may face the problem of not being able to communicate with the country’s people as they talk in different language. Luckily, technology hasn’t left us alone and provided us with many real-time, instant, and multilingual translators. 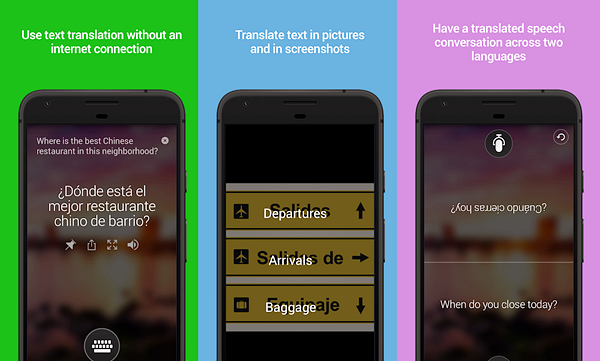 These tools can be used on Android phones and help us quickly find the language characteristics of the country we are in and overcome communication barriers we encounter while being abroad for tourism. 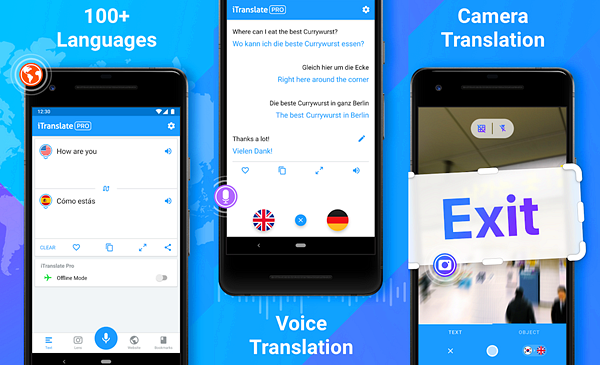 In this article, I will show you the best and highest rated translation apps for Android, and then, it will be your turn to select the best and the most suitable application for you to satisfy your needs. 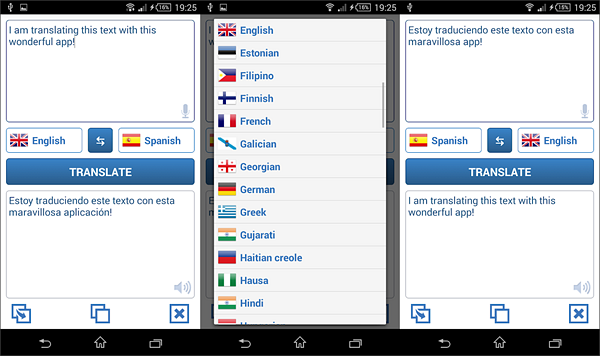 The most popular and may be the best language translator for Android is surely Google Translate, this application that supports 103 by typing online, along with a database you can download and use offline with 59 languages. The application also has a Camera Mode which allows you to take pictures of text for instant translation in 39 languages. And if you were abroad, you will find Conversation Mode which is a two-way instant speech translation in 32 languages, and you can quickly write what you need to translate using a stylus and the application will recognize it if it’s one of the supported 93 languages. The application is totally free to download and install with no ads, honestly, it’s one of the best language translation apps Google has provided, and you can download it via Google Play Store and start downloading the offline languages. As long as we live, as long as we watch the competition between Google and Microsoft goes more exciting. Microsoft Translate is another best free language translator app with a support of 60+ languages. You can use Microsoft Translator to translate online and offline, with text, voice conversations, camera photos, and screenshots. The language translation application is less in language support when compared to Google Translate, but it doesn’t only have a conversation mode, it has a multi-person mode which allows 100 people to talk together in different languages. It also has a plus feature which is the context menu translation which lets you translate text in other apps without the need to open it every time you need to translate. 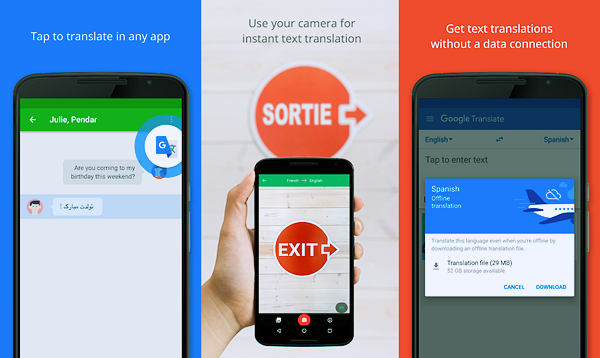 And it automatically syncs your translations between your phone and Android Wear smartwatch. 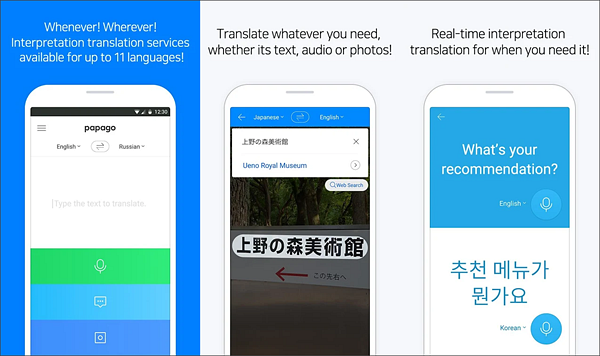 Microsoft Translator is also a free language translator for Android available over Google Play Store, and you can use it online or download the languages packages to use it offline with no ads. One of the best translation apps for Android supporting more than 100 languages with many features that make it different from the others, like giving you the choice to select listening to translations in male or female voices, and provides you with a dictionary and thesaurus for all languages. There is also a Pro version of this language translation application that gives you more features like offline translation in over 40 languages, Voice-to-Voice conversations, Lens feature that lets you use your camera for translation to translate the text instantly, and verb conjugations in different tenses. 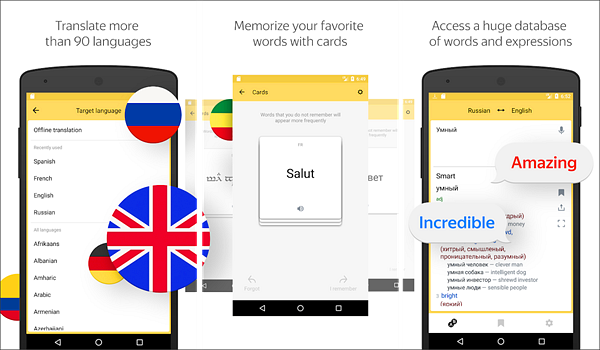 iTranslate Translator & Dictionary is available for free and offers in-app purchases for the previously mentioned features, and you can get it via Google Play Store. A simple free language translator for Android that supports 100+ languages and has the functions of translating voices and text. It also has the feature to convert speech to text to translate it and vice versa. The application is simple, free, and contains ads, and some languages may not work as required with some features. Another great and beautiful language translator app for Android with the support of 90 languages online and 7 offline languages. Yandex.Translate offers a set of special features like listening to you when you talk in 4 languages and it can read 12 languages through the camera (Only available when you are online). You can also translate entire websites directly in the app, and it has a predictive function that saves you time with the ability to speak to your Android Wear watch to see your words translated on its screen. More importantly, this language translation app is free and with no ads at all. 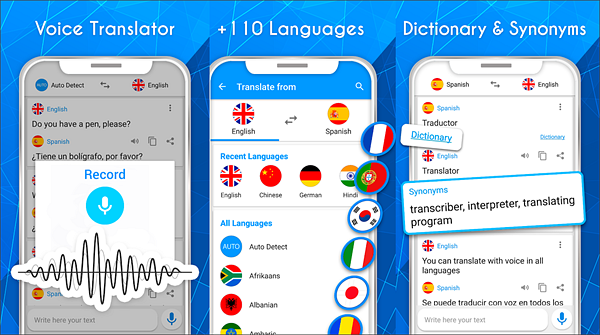 Language Translator is a simple application with easy-to-use interface allows you to translate from English to Spanish and vice versa along with other languages like Russian, French, German, Italian, Chinese, Catalan and others up to 90 languages. The language translator application has some good features like translating instantly between languages and voice translation which allows you to translate others’ words when you are abroad and a reader to say what you need to say instead of you. What’s more, it’s free with no ads. A professional translator with more than 110 languages with a great ability to hear you, translate what you say, and say it in the other language. It also gives you a word suggestion and shows you the right spelling along with the ability to share text directly to other applications. The voice translator app is totally free and contains some ads, but it doesn’t affect its performance. A low number of supported languages should not always mean that you are not so good, but you may be a professional on them. Naver Papago Translate is a great and simple language translation app for Android supports 13 languages Like Korean, English, Japanese, Chinese (Simplified/Traditional), Spanish, French, Vietnamese, Thai, Indonesian, Russian, German and Italian. 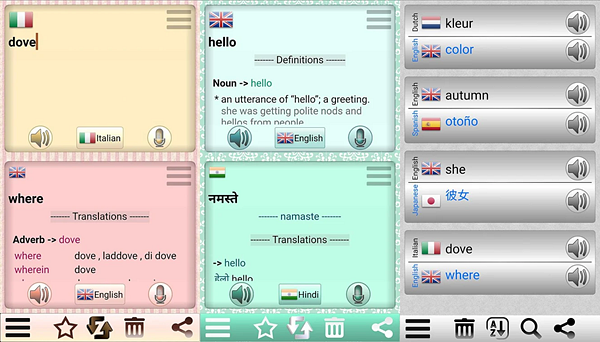 It also has some great features like real-time translation of phrases, real-time translation of voice, conversation translation, image translation (Using Camera with finger selection of text), Dictionary (Provides information to check more meanings), and Phrasebook which provides you with basic expressions for the supported languages without the need of a network connection. Those were the best translation apps for Android, in case you need to translate a document or any type of text or voice they will be within your hand. 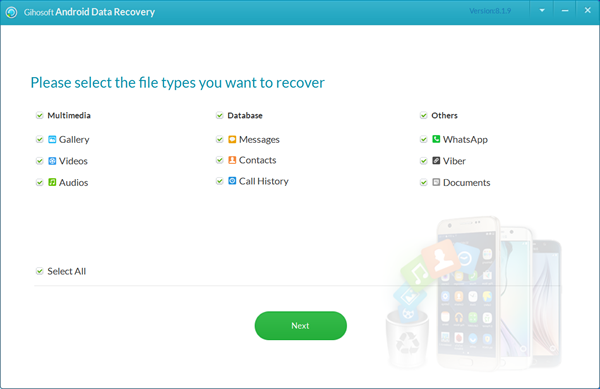 And in case you have lost a document before translating it, don’t hesitate and download Gihosoft Free Android Data Recovery software that allows you to recover all your lost files and data within a few clicks and short process. Don’t forget to share this article with your friends and family, and tell us what is your preferred online language translator .